Lighting Archives - Vintage Shrewsbury Ltd.
We believe that, quite deservedly, we have earned ourselves a reputation as being one of THE ‘go to’ places in the region for home lighting. Almost uniquely placed in our area, we are able to offer the whole ‘package’ of choices in lamp bases & decorative shade solutions. Being actual ‘makers’ of lighting we can even offer you completely bespoke (and, all-importantly, safety-tested) lamps. Here you’ll find some of our most ‘unique’ creations! 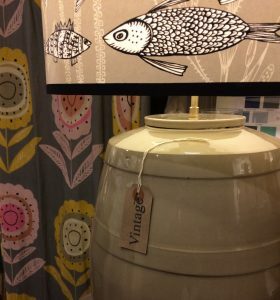 Complementing our diverse array of floor and table/bedside lamps, we also offer shades (in-store only) produced by the very best of British artisan makers; both locally-based and from further afield.